Balls, tools and garden games sit alongside old furniture and bags of rubbish, and while this room of wreckage becomes accepted over time, it doesn't have to be this way. 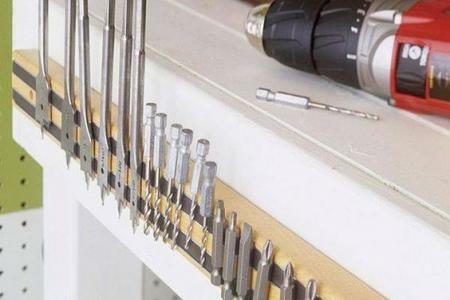 Magnetise your drill bits: Instead of scrabbling to find the right bit each time, keep them all carefully stored and easily accessible with a magnetic strip. Wall storage: Save yourself floor space with this simple, but effective, wall rack for your bikes. All you need is two blocks of wood and a bungee cord to start creating your very own bike rack. Foldaway Workshop: If your garage also doubles as your workshop, this foldaway worktable may be your solution to constantly edging round your workbench to grab the bike pump. Ceiling Storage: Transfer all your lighter and less-used stuff into ceiling storage. This clever idea in our garage storage solutions means that you can get easily to all your useful tools throughout the year. Pipe Up: Place your odd bits of wood and other long materials in a tube on the roof and prevent the inevitable timber moment. Don't Get Screwed: Screw the lids of your jam jars into the bottom of your shelf and fill them with nails. You can easily screw and unscrew the jars without filling up precious workbench space. Fold It Up: Keep your bikes safely stored on the ceiling and never have to suffer a bent tire again when you misjudge your distance from the wall. Bungee Cord Ball Storage: Sports are healthy, fun and a great family activity, but the balls are a storage nightmare. Prevent yourself from being buried beneath an avalanche of balls by using bungee cords. The cords allow you to easily insert and remove balls without having to unpack every single one. 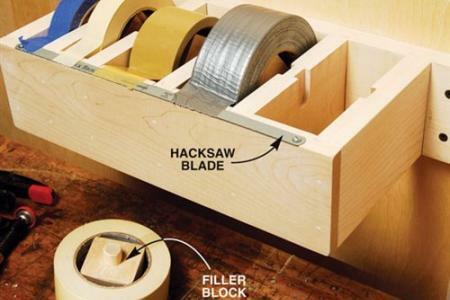 Top Tape Tips: Never find yourself sticky-fingered again with this clever tape storage system. Not only will you always know what tape you have available, but you’ll be able to tear off a piece one-handed.